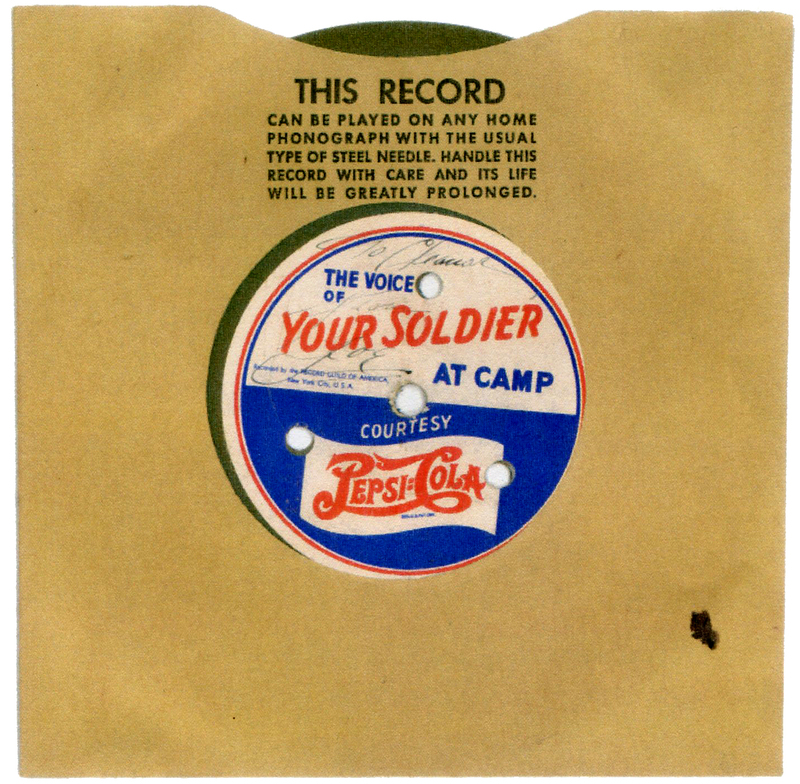 A little over a year ago my sister Domenica received an unexpected gift in the mail from the ex-wife of one of our uncles: a recording of my dad’s voice made in 1942, only months before my parents were married. My dad had just begun his career in the armed forces at Mitchel Field, Long Island, NY. The recording was made free of charge courtesy of Pepsi-Cola. I was thrilled at the prospect of hearing my dad’s voice again. Yes, we have scads of photos of my parents but a voice recording seemed to be so much more special. A more tangible way of remembering my dad, who passed away 20 years ago last November. Only one problem. The disc was recorded at 78 rpm and none of my siblings had a turntable capable of playing at that speed. Domenica managed to make a digital recording of the disc at 45 rpm and I sent that file off to a friend who is an audio/video technician. He tweaked the recording for us but the voice we heard at the adjusted speed never sounded right to us. The next step was for Domenica to send the record to Recordsmith, a company that specializes in transferring vinyl recordings to CD. Before long I was able to pop the CD into my laptop and listen to my dad’s recording in iTunes. All the scratches and static from the 50-year-old recording were still there. The voice of a representative from Pepsi came through loud and clear. And then there was my dad speaking to my mom. Some of the recording was garbled and undecipherable, but the majority of the message was coherent. The voice still didn’t sound right. It was too high-pitched. Furthermore, I detected a New York accent. I never heard my dad have the faintest hint of a New York accent! After all, he was born in Sicily and didn’t come to the U.S. until he was nine years old. And then he grew up in upstate New York. Where did this New York city accent come from? Then I got to thinking about the pitch of his voice. Well, in 1942 he would have been 25 years old. That was the voice of his youth I was listening to. Do people’s voices change that much over the years? Was hearing his 25-year-old voice and comparing it to the middle-aged voice that I remember akin to comparing photos of him at age 25 and 50? It makes sense now to me that he would sound markedly different. Another thing about the recording was also striking. 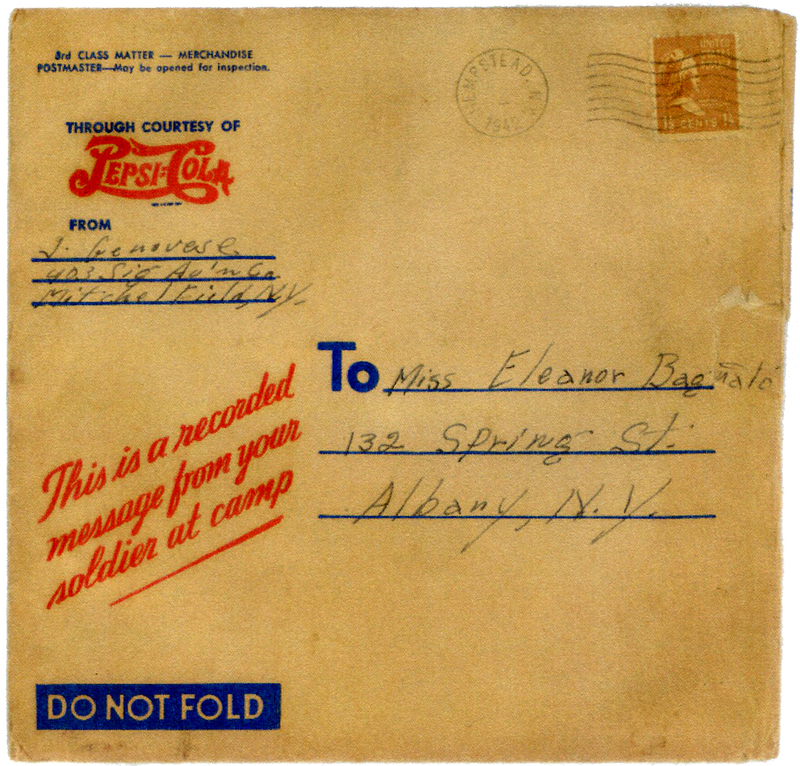 The spokesman from Pepsi introduced my dad on the recording by saying: “Hello, Miss Eleanor Bagnato of Albany, New York. Pepsi Cola company is happy and proud to bring you the voice of your boyfriend, Joseph.” “Boyfriend“?? Whoa, that word nearly knocked me out of my seat. Of course, I know they were only dating each other at the time but hearing my dad referred to as my mom’s boyfriend seemed so odd. As the recording proceeded it occurred to me that my dad must have been reading from a script. His speech was stilted. It surely didn’t sound like an off-the-cuff delivery. But when I thought about that some more, that seemed quite understandable. I thought back to a letter my dad sent me when I was in college. The only letter he ever sent me, in fact. (My mom was the letter writer.) It was written as you would expect an office memo to be written, complete with numbered paragraphs and generous sprinklings of military jargon. Don’t get me wrong. My dad could be an eloquent speaker when he wanted to be. I remember how I loved to hear him recount anecdotes to dinner guests. One of my favorites was the story of how the wine Est! Est!! Est!!! got its name. He also had a wonderful sense of humor and was famous for joking around in Italian with Italian waiters, asking for the check by requesting la dolorosa (the sorrowful one) or la lacrimosa (the tearful one). But, when it came to matters of the heart and to speaking to his loved ones, he could become remote and taciturn. But certain gestures he made, though awkward, were genuine and heartfelt. Once, when I was in high school in Frankfurt, Germany, he returned from a business trip to Italy with a gift for me: a pair of gold pierced earrings. “But I don’t even have pierced ears!” my teenaged self wailed. Of course, it wasn’t long before I did get my ears pierced and those earrings became prized possessions. I’m grateful to have this recording of my father’s voice. I also own a stack of letters he wrote to my mom while he was stationed in Korea and my mother was back in the States with three toddlers — my older siblings — only three of the six of us had been born by then. It’s strange, then, to only have access to my dad’s side of the conversation through these memorabilia, when my mom was the more talkative of the two by far. Lovely old olive tree on the grounds of Beit Gemal. We took a drive to Beit Gemal monastery, located near Beit Shemesh, just east of Jerusalem. We had previously purchased a few ceramics made by the nuns who live in a convent there at a sale in our neighborhood. We thought it would be nice to visit the monastery itself. Aside from the nun’s convent on the beautifully landscaped grounds of Beit Gemal there is also a larger monastery for Salesian monks, two churches (one for the monks and one for the nuns), a concert hall and shops where one can purchase locally made olive oil, honey, jam, and wine as well as the ceramics made by the Sisters of Bethlehem. We purchased two more ceramics to add to our collection, some olive oil and honey. From the monastery we drove to a nearby Israel Nature Reserve to visit Soreq stalactite cave. I’ve never visited a cave with these formations before and I was totally enchanted. It felt as if I was walking through a fantastical fairyland. Gotcha! He is not at all happy…but if not for our intervention, Baxter and Lulu would not have been as kind. A colorful creature…and quite agile. Moments after taking this photo he leapt from Brad’s hand onto the patio with a funny little thudding sound. Released on the patio. He spent quite a bit of his new-found freedom circling this post. 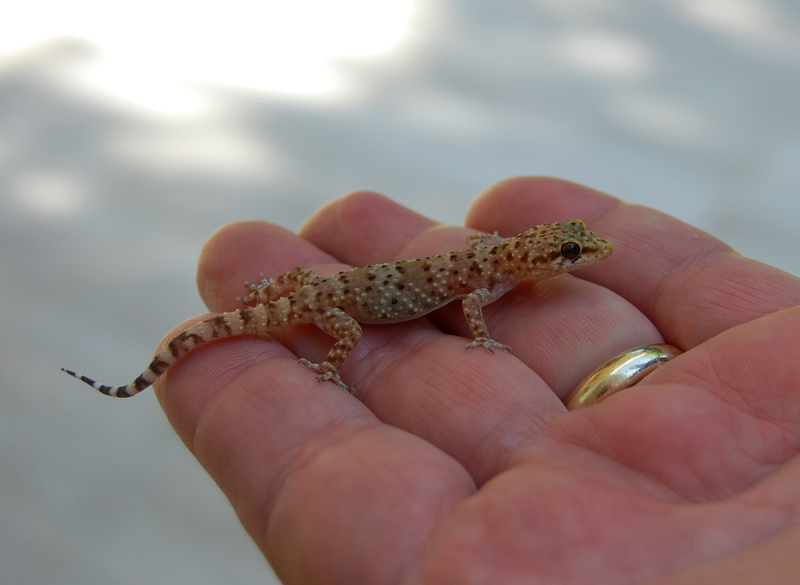 Last October a little gecko made its way into our living room. Brad was able to scoop him up and put him outside before Baxter or Lulu could cause any damage. Today, while readying the grill for a cookout, we found another gecko on our patio. Baxter and Lulu were eyeing him intently from inside the sliding glass doors. Before we knew it, as we were making our way inside, the little lizard decided to come in with us. Brad scrambled again to capture the critter before Baxter and Lulu could. 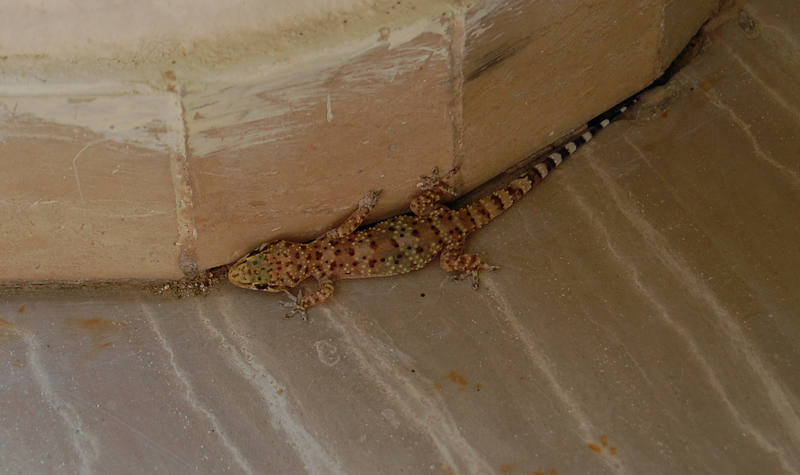 The gecko was caught and placed back on patio. As I began roasting peppers, I looked for the gecko and he was nowhere to be seen. At least not by human eyes. But a pair of feline eyes knew the gecko was still close at hand. I saw Baxter eyeing a spot just outside the sliding glass doors. I shook my head, thinking the poor cat doesn’t realize the gecko is gone. Wrong! 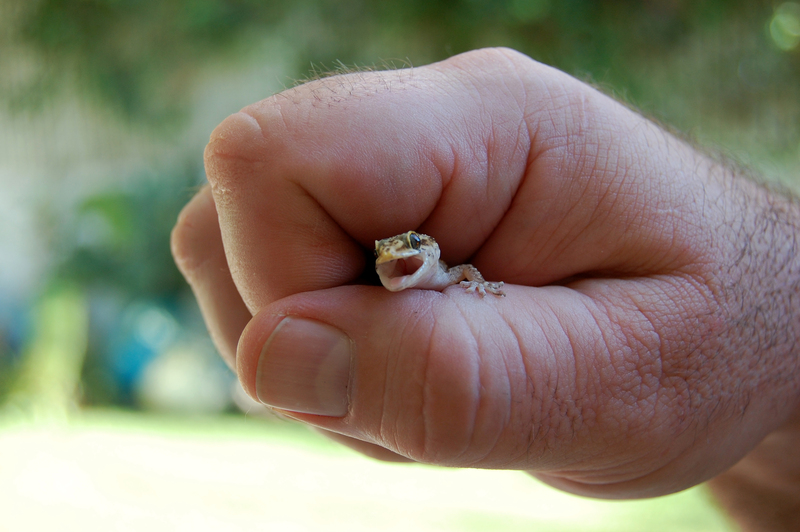 Brad found the gecko back inside the house. Scooped him up again and this time we are pretty sure he is gone for good. Why are we so sure? Baxter and Lulu have given up their post by the sliding glass doors.